Our product range includes a wide range of deck sheet. 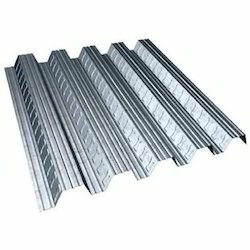 deck a type of steel decking profile-one of its kind in india at par with international standards of steel design and strength, this decking can be used as a composite floor system or as a permanent work form. it blinds with concrete slab and together forms a part of the floor structure. the interlocking between the concrete and the floor occur by a system of embossment and ribs that are built into the deck, creating a reinforced concrete slab. this fast and simple installation using high strength product gives immediate access to a working platform of permanent form and positive reinforcement.